Jakob Aron Rempel, one of the most prominent leaders of the Mennonite Church in Russia, elder of the Neu-Chortitza and Nikolaital Mennonite congregations, was born on 8 April 1883, the first of 13 children of Aron A. and Justina Peters Rempel, at Heuboden in the Borozenko settlement, Ukraine. He served as village schoolteacher 1901-1905. He studied theology, philology, and philosophy at the Predigerschule and the University in Basel, Switzerland, 1906-1912. In 1913 he became a teacher in the Zentralschule in Chortitza and was ordained preacher there. He was transferred by the governmental school authorities in 1915 to Stalino (formerly Yuzovka) as teacher of German and French, and in 1916 to the Nikopol gymnasium where he was also acting principal. 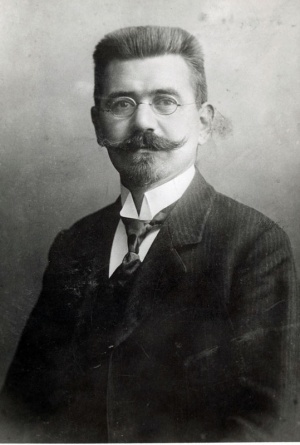 In 1918 he became private lecturer at the newly founded University of Ekaterinoslav, where he was recommended as professor, though this was not carried through until 1920 when he was called as professor to the University of Moscow. While he was considering whether he would accept another call as elder of the Neu-Chortitza congregation, the Moscow University rector declared him deposed from the professorship because he was considering a religious office. He was ordained elder 2 May 1920, and soon thereafter accepted the call to serve also as elder of the Nikolaital congregation. He located in the village of Grünfeld. His bishopric now covered a territory some 40 x 60 miles in area including 22 villages, in which he averaged 40 communion services per year, in addition to a heavy load of pastoral duties and teaching in Bible conferences, and the ordination of many new preachers due to the death or emigration of a large number of preachers. Rempel also served the brotherhood at large. In 1921-1925 he rendered special service in Zagradovka by request of the church there. In 1922 he was chosen chairman of the Kommission für kirchliche Angelegenheiten (KfK) at the General Conference in Chortitza, a position with heavy responsibilities for negotiations in Moscow which he held until 1925, when he refused re-election on the ground that it would be wiser to change leadership. However he continued in a leading position in the KfK and was counted on to head the ministers' training school which he was asked to organize. He was sent as a delegate to the first Mennonite World Conference in Basel in August 1925, but was denied a Swiss visa; so he made a three months' tour of the Mennonite congregations in Germany. He was appointed special commissioner of the KfK in 1928 to continue negotiations with the government. He continued to serve widely in Bible conferences, in 1929 for instance for two weeks in the Orenburg settlement. On 8 September 1929 Rempel was expelled from Grünfeld, and on 13 October 1929, his property was confiscated and his family expelled. On 16 November 1929, he was arrested in Moscow as he was seeking emigration papers. He was held seven months in Moscow in arrest, was placed under heavy pressure to renounce his faith, and offered a professorship in the University if he would do so. Upon his obdurate refusal he was sentenced to 10 years of hard labor in the Solovki camp on the White Sea. He escaped from Solovki on 24 January 1932, but was arrested again on 13 March 1936 at Khiva and was brought to trial and sentenced at Piatigorsk in the North Caucasus. He was imprisoned first at Vladimir near Moscow and then at Orel. His last letter to reach the West was dated 12 June 1941. On 8 September 1941 Rempel was again convicted and sentenced to death. He was shot on 11 September 1941, along with 161 other prisoners. Almost 50 years later, on 15 March 1989, a resolution of the USSR Prosecutor’s Office exonerated J. A. Rempel. His family, which reached Canada (one son remaining in Germany), has 116 letters from Rempel written during the years 1930-1941 in addition to much other material. Condensed by Harold S. Bender from the article on Jacob A. Rempel by Alexander Rempel, his son, in Mennonitisches Lexikon III: 470-474. Letkemann, Peter. "Jakob Aron Rempel." Bearing Witness Stories Project. 25 August 2014. Web. 29 August 2014. http://www.martyrstories.org/jakob-aron-rempel/. Rempel, Peter A. Aeltesten J. A. Rempel's Lebens-und Leidensgeschichte. Gretna, 1946. Tows, A. A. Mennonitische Märtyrer. Abbotsford, 1949-1954: I, II. Rempel, Alexander. "Rempel, Jakob A. (1883-1941)." Global Anabaptist Mennonite Encyclopedia Online. 1959. Web. 25 Apr 2019. http://gameo.org/index.php?title=Rempel,_Jakob_A._(1883-1941)&oldid=146700. Rempel, Alexander. (1959). Rempel, Jakob A. (1883-1941). Global Anabaptist Mennonite Encyclopedia Online. Retrieved 25 April 2019, from http://gameo.org/index.php?title=Rempel,_Jakob_A._(1883-1941)&oldid=146700. Adapted by permission of Herald Press, Harrisonburg, Virginia, from Mennonite Encyclopedia, Vol. 4, pp. 298-299. All rights reserved.